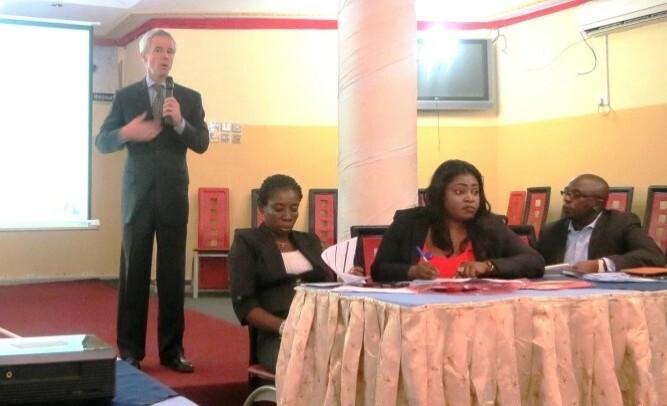 Recently, USAID/Nigeria, the Health Finance and Governance (HFG) and Strengthening Integrated Delivery of HIV/AIDS Services (SIDHAS) projects collaborated with Rivers State Agency for the Control of AIDS (SACA) to develop a new resource mobilization strategy, launched at a meeting on October 19, 2015. The new strategy is designed to increase government financing of HIV/AIDS programs in Rivers State. According to the National Agency for Control of AIDS (NACA), Rivers State has the highest HIV prevalence out of all 36 states in the country, with a reported prevalence rate of 15.2 percent in 2012. USAID/Nigeria Mission Director, Michael Harvey, opened the meeting, remarking that the lack of government funding to the HIV/AIDS response is of concern, and an area of focus for USAID support to Nigeria . A total of 62 participants attended the strategy development meeting, including notable state government employees—the Honorable Commissioners and Permanent Secretaries of Health, Economic Development, Finance, Women Affairs, and Social Development. The Accountant General’s office and the State House of Assembly Health Committee Chair also attended the workshop. The support and approval of these stakeholders who are not traditionally involved in HIV/AIDS programming is critical for promoting mobilization of government financial resources to the HIV/AIDS response. 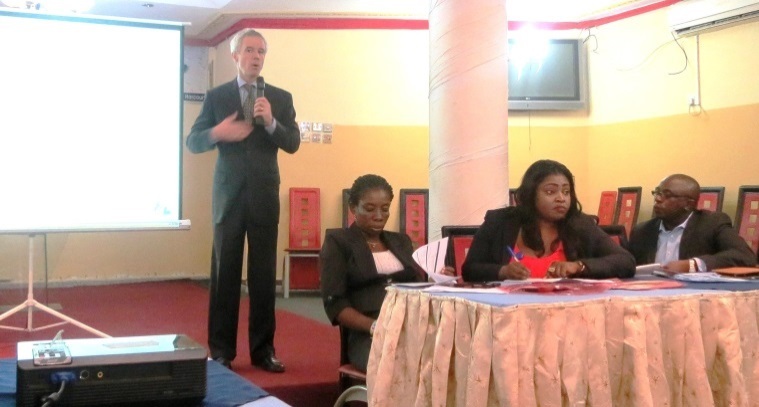 USAID/Nigeria Mission Director, Michael Harvey at the workshop. Mr. Harvey noted USAID intends to align future programming with the state government’s leadership and commitment to its HIV/AIDS programs. His sentiments on the critical need for increased government financing were echoed in later presentations by some of state’s HIV/AIDS program managers. In the overview presentation on the sustainability roadmap, Dr. Owhonda of Rivers State AIDS and STD Control Programme (SASCP) and Dr. C. M. Okey of SACA identified the need for increased political will and approaches that engaged the state’s private sector. HFG’s Dr. Gafar Alawode presented a possible path forward in his presentation on domestic resource mobilization. “We need to mobilize additional resources to get health workers, to get drugs, to get infrastructure, and may other things […] We need to achieve more health for the money itself,” Dr. Alawode said. At the workshop, HFG also presented results of its situational analysis report for HIV/AIDS financing in the state at the meeting. An additional working meeting was held the next day to draft the resource mobilization strategy for the state, for presentation to the Rivers State Deputy Governor. Included in the draft strategy were activities focused on strengthening advocacy to increase political will, and better engaging the private sector. HFG will continue its work in Rivers State on the resource mobilization strategy and capacity building, and also to strengthen the communications and financial process between HIV/AIDS Ministries, Departments, and Agencies (MDAs) and the Ministry of Economic Planning and Accountant General’s Office as part of the overall effort to secure increased government resources for the HIV/AIDS response in the state.